Allister Coetzee and Brendan Venter’s comments since the Springboks’ record 57-0 loss to the All Blacks are as concerning as the performance itself, writes SIMON BORCHARDT. On Saturday, the Boks suffered their biggest defeat in 126 years of Test rugby. 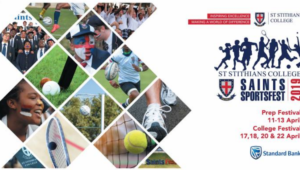 They conceded eight tries, and could not score any points themselves. They were humiliated. 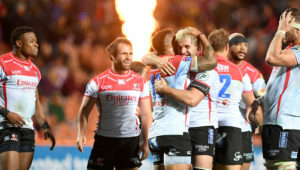 Yet in his TV interview directly after the match Coetzee, incredibly, said that there were ‘a lot of positives that we can still take out of this game’. The Boks missed a whopping 31 tackles in the match, with winger Raymond Rhule slipping nine, but Coetzee said he was ‘pleased with a couple of brilliant defensive efforts’. The coach also said things could have been different had the Boks not conceded three tries to give the All Blacks a 24-0 lead, and scored a couple of points or a try themselves. The Boks had just been outplayed by a world-class team, he added. At the post-match press conference, Coetzee said the defeat was ‘definitely not because of a lack of effort’ from the players. 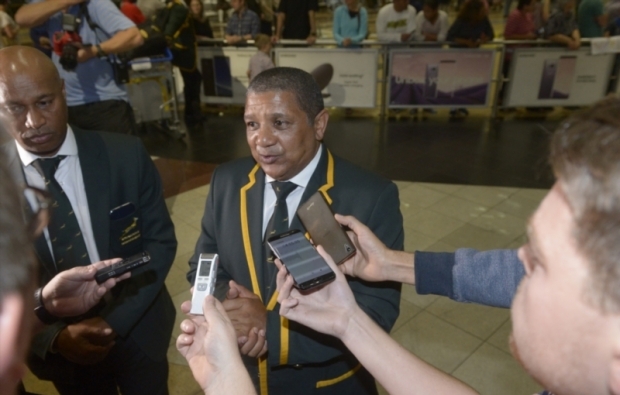 He spoke about ‘passages of great defence and passages of great attack’ from the Boks. When asked about the team’s big weakness – the back three – the coach said he didn’t think it was a problem. Coetzee had a 19-hour flight from Auckland to Johannesburg to accept what had actually happened in Albany, yet he remained defiant after arriving at OR Tambo International Airport. He insisted the team ‘is moving in the right direction’, that ‘one loss doesn’t define this team’, and that ‘one must not only focus on the storms, but look at the rainbow as well’. Coetzee said he still believed in himself as a coach and shrugged off calls on social media for him to resign, saying that he works for SA Rugby and not Twitter. The head coach was not the only Bok management member in deep denial. Defence coach Brendan Venter took to Twitter on Sunday, saying that ‘there was nothing wrong with our effort’ against the All Blacks and that the Boks had simply been outplayed. Venter added that the Boks ‘had one very bad night at the office’ and insisted it ‘does not make us a bad team overnight’. Coetzee and Venter both appear to have dealt with the crushing defeat by firmly sticking their heads in the sand. Can you imagine an All Blacks head coach saying there were a lot of positives to take from a 57-0 defeat? Can you imagine the All Blacks head coach and defence coach both saying that the team had not conceded eight tries because of a lack of effort from the players? I can’t. In fact, I’m pretty sure both would have done the honourable thing and resigned. Coetzee should have come out straight after the match and apologised to the nation for the performance. He should have called it what it was – a disgrace to the green and gold jersey – and admitted that the coaching staff and players were to blame for the defeat. 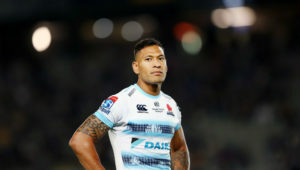 He should have acknowledged that wins against weak France and Argentina teams had proved to be a false indicator of the team’s progress and that the All Blacks had shown where the Boks really stand in world rugby. Coetzee should have admitted making selection errors, including starting Francois Hougaard (who had struggled against Argentina) at scrumhalf and Rhule (who has been defensively poor all year) on the wing. You did not need the benefit of hindsight to know that the All Blacks were going to target and ruthlessly expose Rhule. He should have said that while he did not plan to resign, he knew that beating the Wallabies and All Blacks at home was now non-negotiable if he were to keep his job. Venter, meanwhile, could have used Twitter to explain why the Boks did not adopt a rush defence system. The British & Irish Lions, Australia and even Argentina had used it to great effect to shut down the All Blacks’ attack, so why did the Boks not do the same? John Plumtree said last weekthat the Bok defence had been too passive and would be exposed by the All Blacks. Why did Venter not know that? If Venter was happy to take the credit for the Boks’ defensive performances against France and Argentina, then he – and not Coetzee – needs to take the blame for the defensive disaster in Albany. The fact is that unless the Bok coaches and players face up to what really happened against the All Blacks, this will not be a once-off horror show, as Coetzee tried to portray it, but a regular occurrence when rugby’s once greatest rivals meet. After all, in three matches over the past two years, Coetzee’s Boks have conceded 155 points and 23 tries against the All Blacks, while scoring just 28 points and one try themselves.